from ‘Irish Ceramics at Churchill’ by Peter Francis. By permission of Churchill House Press. 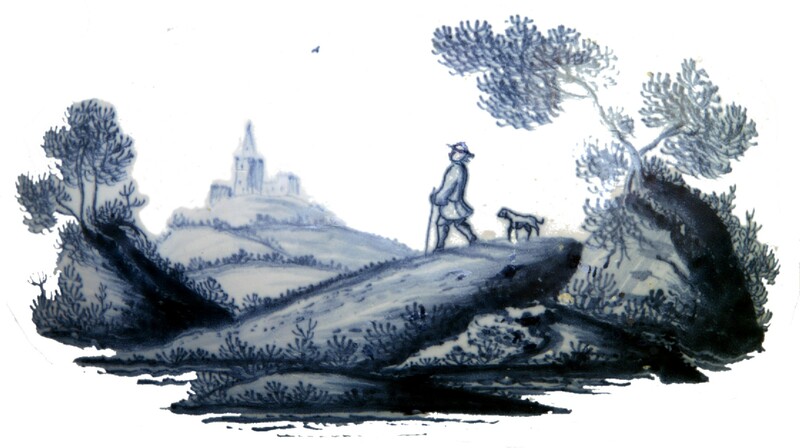 From the first time I saw examples of the blue and white earthenware made in Dublin’s World’s End pottery in the eighteenth century, I was inspired by the potential for using the motifs and images to make a wallpaper. 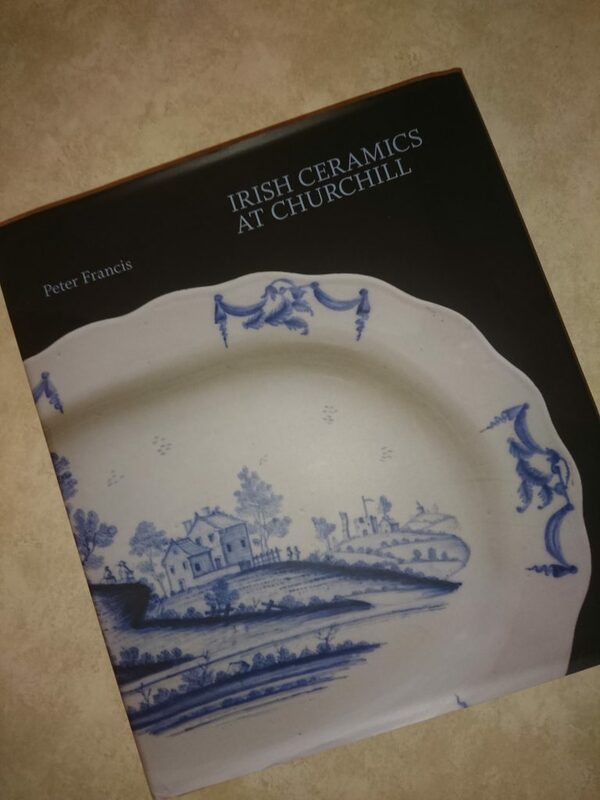 The publication of Peter Francis’ beautifully illustrated book on ‘Irish Delftware in Churchill House’ in 2017 rekindled my interest, and coincided with our decision to launch a new collection of wallpaper patterns in Spring 2019. The publishers very kindly made the images from the book available as a design source for this project. But how to turn a series of photographs of plates, jugs, bowls and platters into a wallpaper design? Rather than simply present an arrangement of plates and other pieces as if they are real objects hanging on a wall, I wanted to lifts the motifs from the objects and draw them together into a repeat pattern that would present them in a new context. The first thing was to select the motifs that had the most potential. 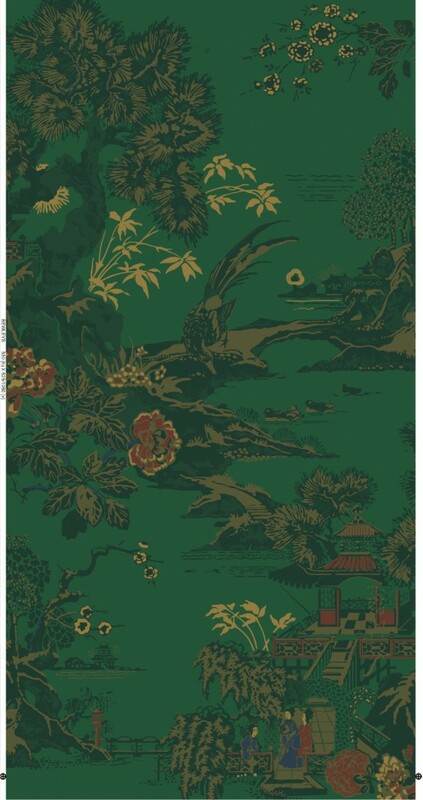 Apart from the landscape vignettes (which seem recognisably Irish), there were images reinterpreted by the World’s End painters from imported Chinese wares – pagodas, oriental trees and birds and flowers. Then there the borders and geometric patterns used around the edges of plates. 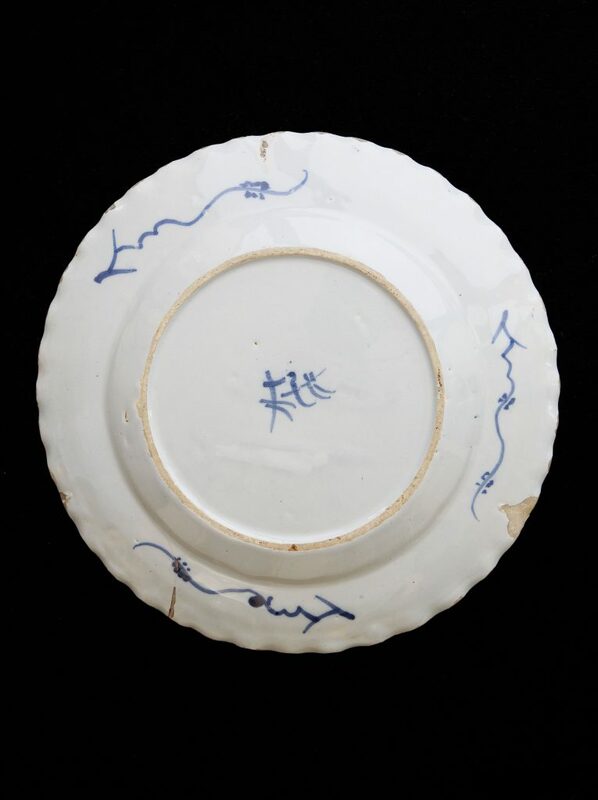 Even the makers’ marks seen on the bottom of the plates have a lovely calligraphic quality that could be used. With image editing software it was relatively easy to eliminate the backgrounds from each photograph leaving only the blue painted brushstrokes of the motifs. This made it possible to arrange and rearrange motifs on the computer screen, to see how they might unite to form a pattern. There are endless possibilities, but from the start it was clear that this would be a fairly large-scale, narrative pattern. Then come all sorts of technical questions about how to manipulate the images into a form suitable for printing. 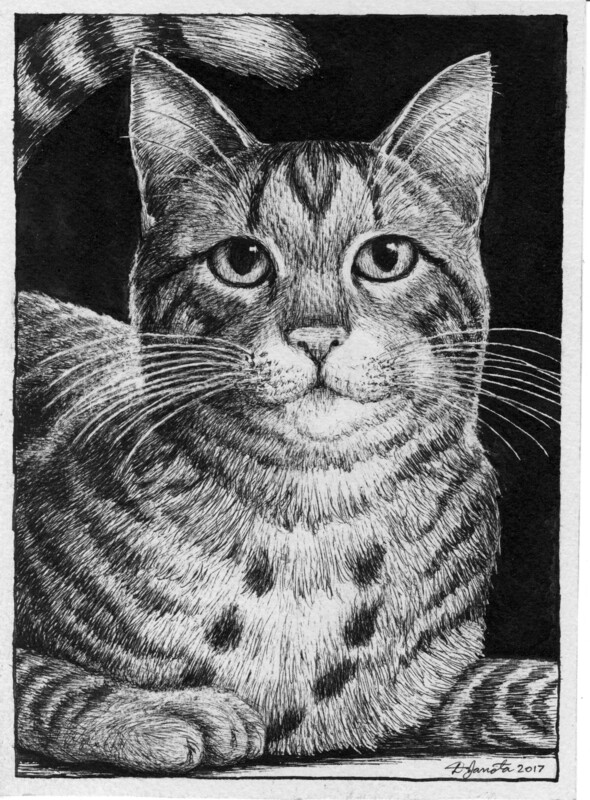 The close-up photographs from the book give every nuance of the painter’s hand, but for hand screen printing or digital printing an image has to go through a process of colour separation in order to control the colouring of the final product, especially if alternative colourways are to be produced. If this can be done by digitally editing the photos then it will help preserve all the painterly character of the original motifs in the finished wallpaper. 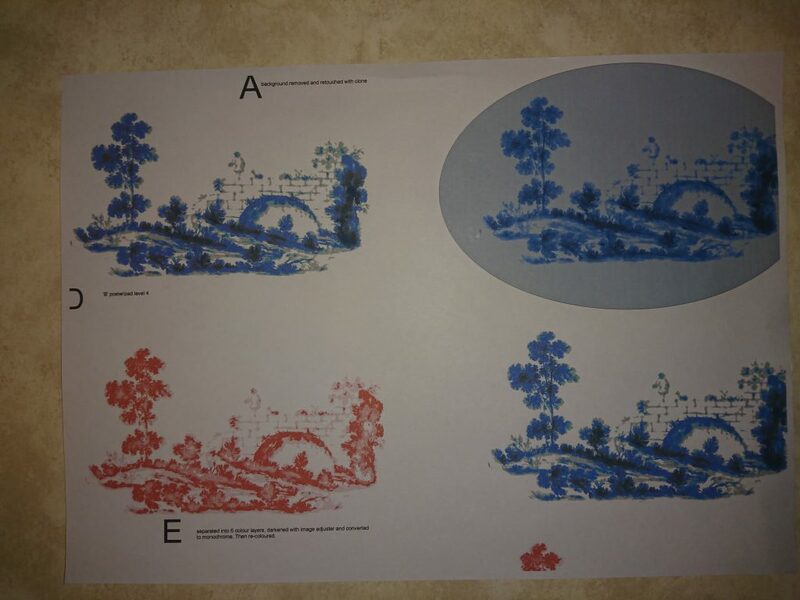 If this doesn’t work we will have to hand draw each motif, tracing from the photos with a separate tracing for each shade. Not sure yet how this is going to proceed, but hopefully it will be a few steps further on by the next blog post. 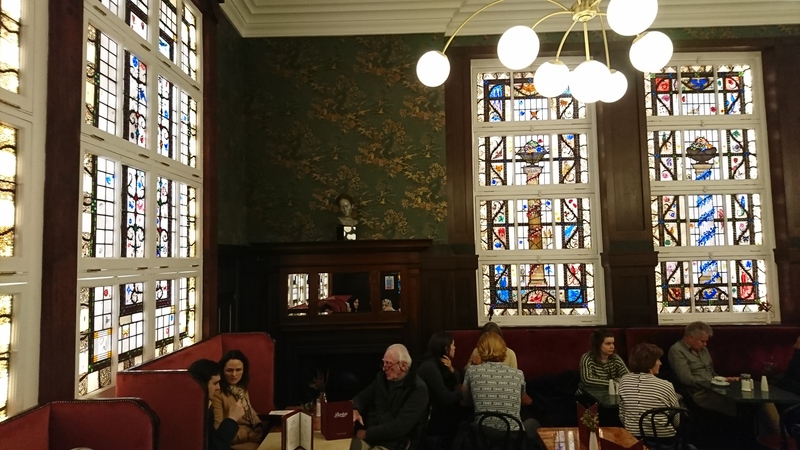 It isn’t often that I have to join a queue to see my own wallpaper, but this morning I did just that, standing in a line of expectant people waiting to enter the newly-restored Bewley’s Oriental Café on Grafton Street, Dublin, which has been closed since February 2015. 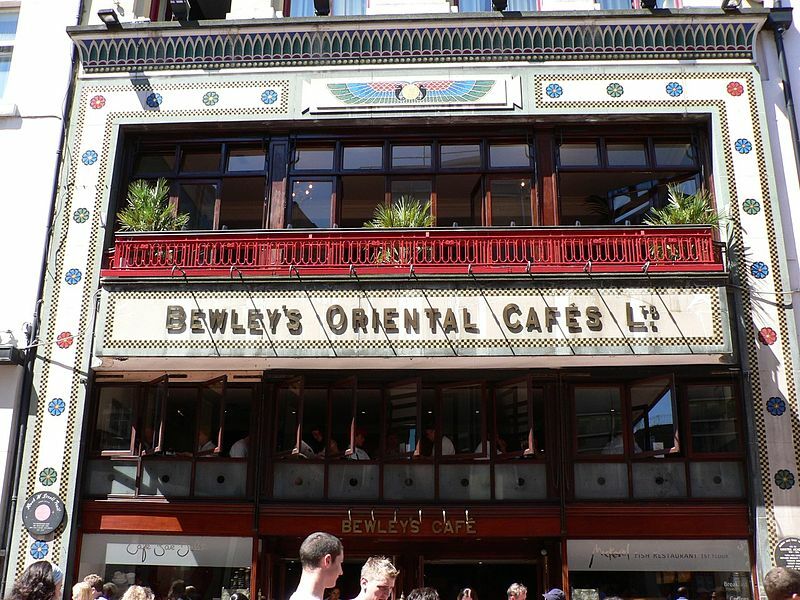 Bewley’s Grafton street café opened for the first time in 1927, the largest and most splendid of the family firm’s Dublin branches. (The first one, on Georges Street, opened in 1894.) The beautiful façade, embellished with gold and coloured mosaics, is one of Dublin’s most recognisable landmarks. Inside, the most striking decorative feature is the set of six large stained glass windows commissioned from the Irish artist Harry Clarke (1889-1931) in 1928, three years before his death. 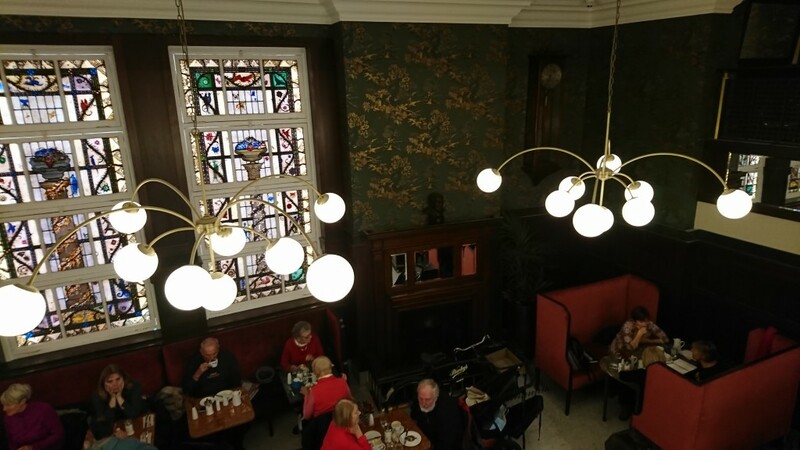 The jewel-like colours of Clarke’s fantastic birds and plants filter light into the back section of the café, adding greatly to the experience of enjoying coffee and traditional Irish tea brack in the high-backed, deeply-upholstered banquettes. 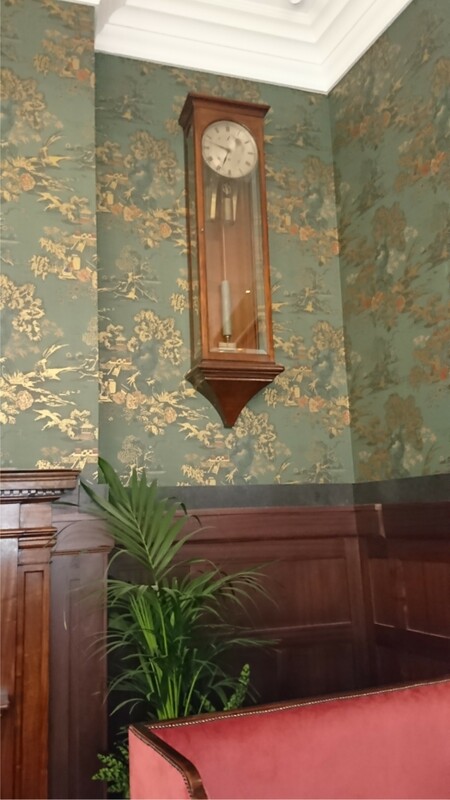 Wallpapers from several phases of redecoration were found during the renovation works, but the earliest of these, and the pattern which probably graced the walls when Bewley’s first opened its doors, is a large-scale, Japanese-themed design, block-printed in nine colours, with metallic bronze highlights. 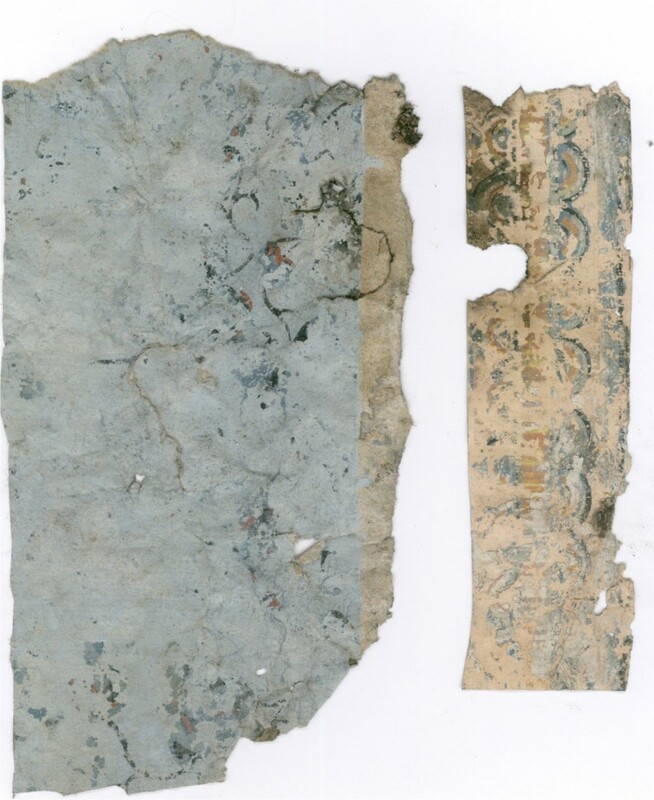 Enough of the paper was found to provide the full repeat of the pattern, although it had evidently been through a fire, and was darkened by smoke and soot, making it very hard to discern the details. Happily, the clients and their architects were enthusiastic enough about the find to commission a copy of the paper for the restored café. Too fragile to remove from the wall, the only option was to take photographs and work from these in recreating the design, which comprises a Japanese landscape of rocks, pines, water, a temple, birds and elegantly-dressed women. With a repeat length of over one metre, this was a large and detailed piece of artwork. 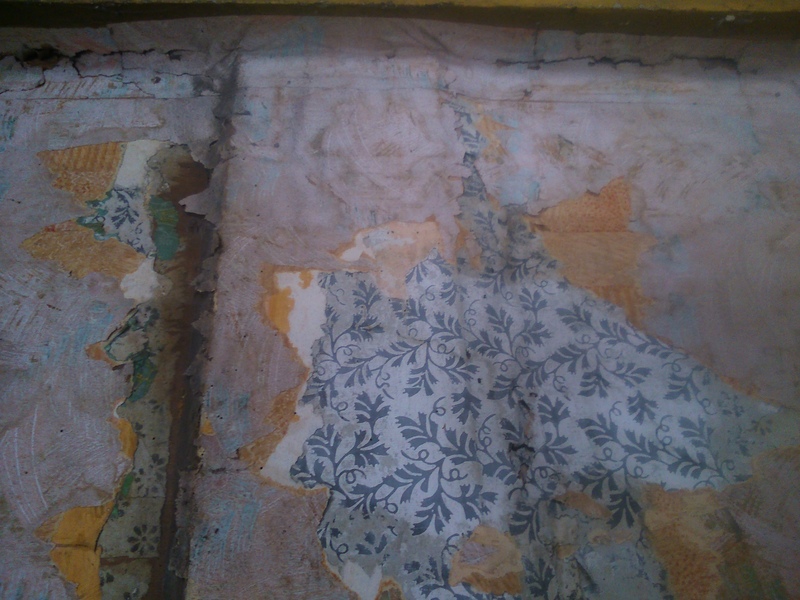 Smoke-damaged fragments of 1920s wallpaper, found during renovation. After months of squinting at enhanced images, we were finally able to print some samples of the pattern. Clever visualisation software also allowed a virtual view of the planned interior to be papered with the pattern, and the results looked encouraging. At the client’s suggestion different colourings and backgrounds were investigated. The original paper was printed on a cream ground, but for the new reproduction a dark green, inspired by the Harry Clarke windows, was proposed. Lengthy research in wallpaper history sources, collections and on-line archives had produced nothing to confirm where and by whom the paper was originally made, although the likelihood was that it had come from one of the top English companies of the day. This was confirmed when ‘our’ pattern appeared among the illustrations to an article on the historic wallpaper collection at Temple Newsam House in Yorkshire, published in the Wallpaper History Review in late 2016. Perhaps not surprisingly, the pattern had been produced by the renowned firm of Arthur Sanderson and Sons (who continue their proud tradition of wallpaper and textile manufacture to this day) and bears the name ‘Coromandel’. Further research might, it is hoped, tell us when the paper was first printed and the name of the designer. The colourway of the Temple Newsam sample is possibly the same as the fragments found in Bewley’s. ‘Coromandel’ wallpaper by Arthur Sanderson & Co, circa 1927; from the historic wallpaper collection at Temple Newsam House, Yorkshire. 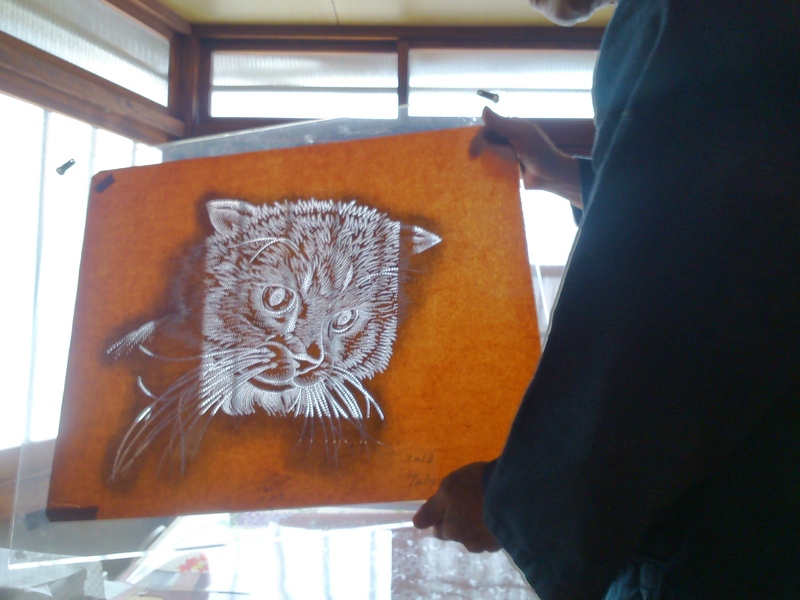 Of the available reproduction methods, the one chosen was a combination of digital and hand screen printing. A fully block-printed or screen-printed copy would have been sumptuous, but was ruled out by budgeting and scheduling constraints (not to mention the risk of the all-too-human printer running out of stamina producing the large number of rolls required). In the present state of the technology it is not possible to print metallic colours digitally, but screen printing by hand over a nine-colour digital print provided a fitting and beautiful new version of the historic pattern. This now forms part of an interior which, no one could deny, recaptures the essence of Bewley’s in former times. The essential ingredients – the tall polished wainscotting and ‘hat shelves’, the banquettes with their plush burgundy upholstery, the stained glass, the black and white livery of the friendly staff – have been enhanced to great effect by the careful choice of white marble floors, Kilkenny marble counters and many other details. The overwhelming feedback in the media and from listening to those around me on my visit, is that the good old days are back again on Grafton Street. For over two centuries, Japan’s only point of contact with European nations was the tiny man-made island of Dejima. Lying only a few metres offshore in Nagasaki harbour, Dejima was connected to the mainland by a heavily guarded bridge, whose purpose was to control the passage of those goods permitted by the Japanese authorities. Anything else – including the Dutch traders who inhabited the island, or their Christian religion in the form of bibles or religious artefacts – had to stay on the island, except for officially sanctioned delegations. Dejima still exists, although it has long since become land-locked by Nagasaki’s expansion into land reclaimed from the harbour, and is now surrounded by skyscrapers and busy freeways. The buildings and gardens have been restored to their appearance in the eighteenth and early nineteenth centuries, giving the visitor a fascinating insight into the living conditions of the Dutch traders. The most senior of these was the Captain, whose quarters were by far the most spacious and well-appointed on the island. The first-floor suite includes a drawing room and dining room furnished with European furniture, the walls and ceilings covered with block-printed papers. 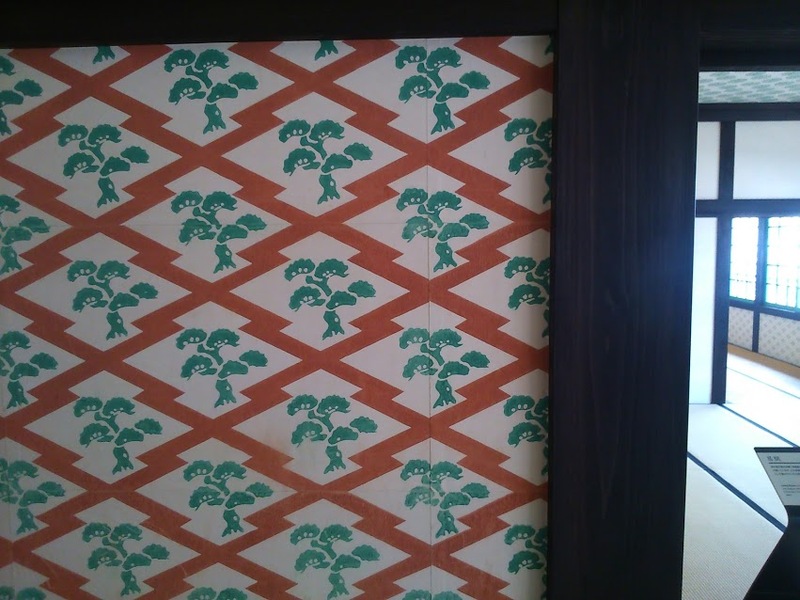 These are not imported European wallpapers, however, but examples of the Japanese craft of karakami: older than wallpaper and still practised today in at least two Kyoto workshops. Most commonly, karakami are used to cover sliding doors or fusuma, which are constructed as a wooden lattice covered with up to six layers of washi (Japanese paper) beneath the decorated kara-kami surface. These are seen in tea houses, temples and traditional style dwellings. 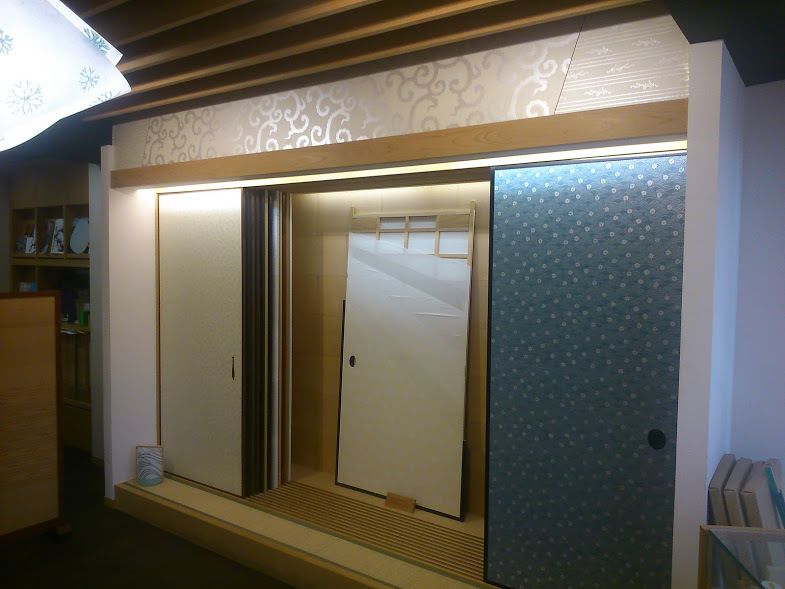 Karakami are also used like wallpaper to cover entire walls, though not usually as extensively as at Dejima. Generally they are used sparingly, in keeping with the ‘less-is-more’ aesthetic of Japanese interiors. 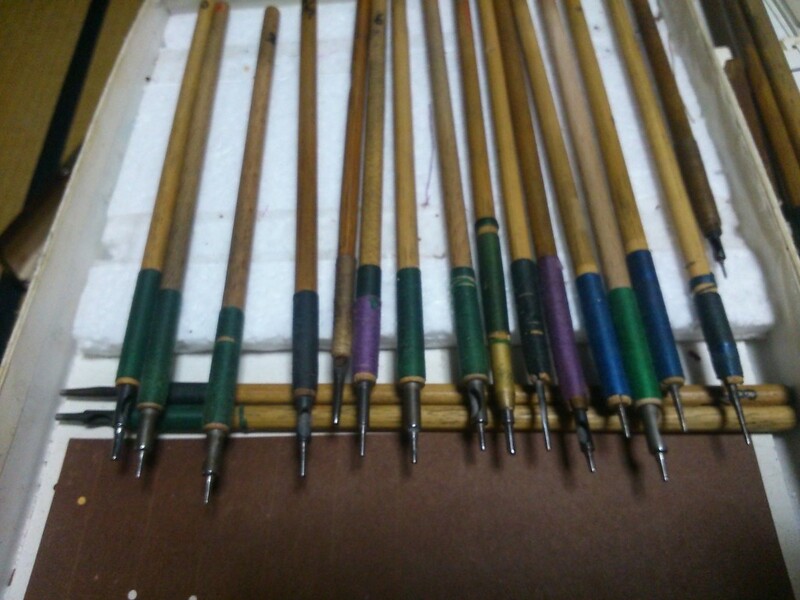 Karakami also have smaller-scale applications such as bookbinding, and recently the patterns have found their way onto a variety of modern artefacts using less traditional printing technologies. 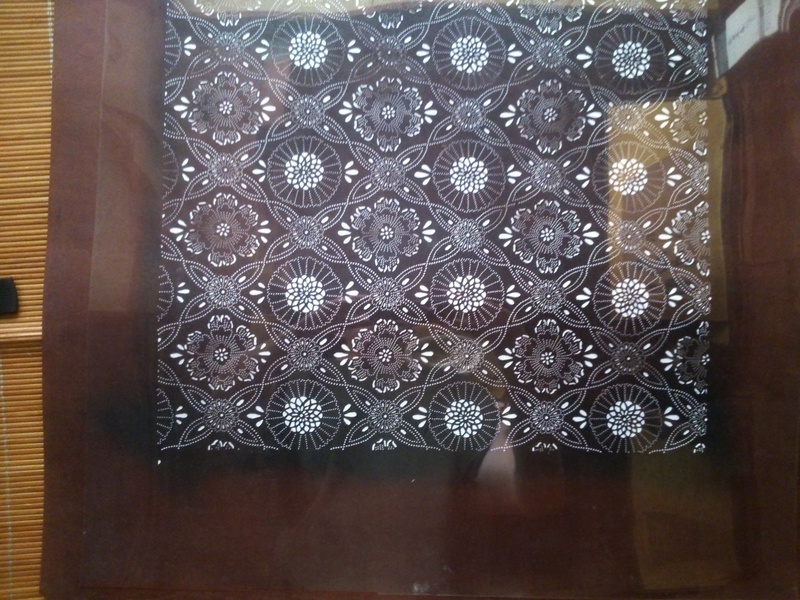 To a western student of wallpaper printing, the remarkable feature of karakami is that, while the materials and techniques are in many ways recognisable, the process appears to be an ‘upside down’ version of European block-printing (although in view of karakami’s antiquity it would probably be more correct to say that the Western technique is inverted.) In karakami, the block is stationary and face-up. 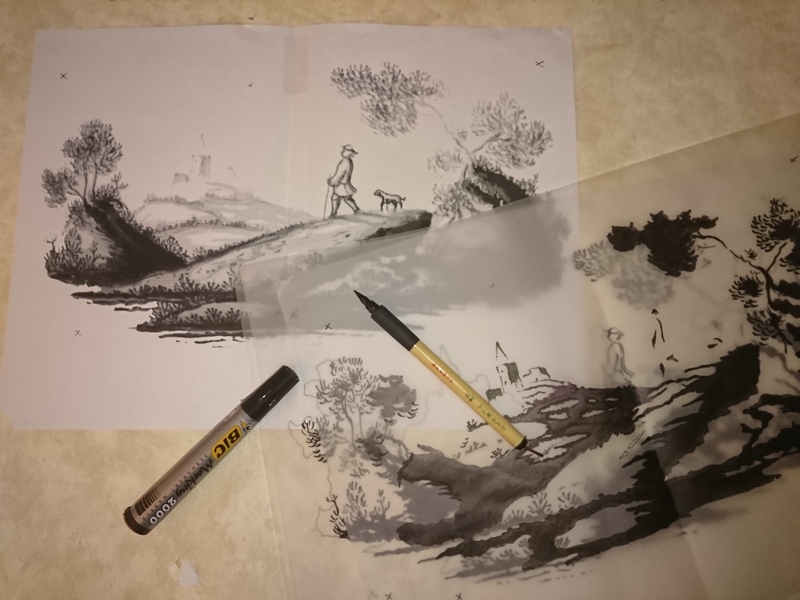 It is inked using a colour sieve, but the sieve is held in the hand and dabbed onto the printing surface. Gentle hand pressure is all that is required to transfer the pattern to the paper, and repeats are printed by repositioning the block under the paper, rather than the other way round. Takeshi Nishimura is a second-generation master of the art of cutting katagama – the paper stencils used in the pattern-dyeing of kimono cloth. 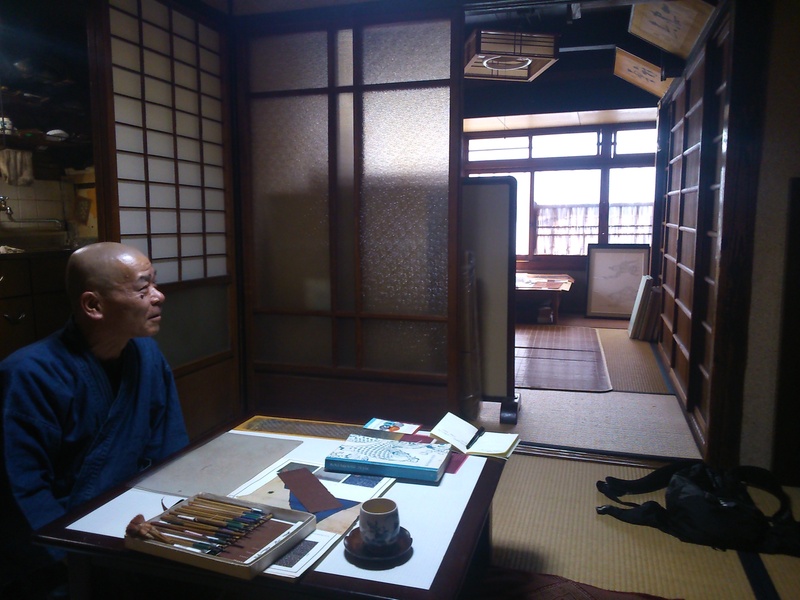 His workshop occupies the ground floor of the house where he was born in Kyoto’s Nakagyo-ku ward, and where he learned the craft from his father, who established the business in 1938. The house is compact and traditional in style, with tatami floors and a house-altar in one corner. Takeshi works at a low table, using the tools he inherited, the only modern equipment being a highly-efficient LED light mat. Resist-dyeing of textiles in Japan dates back to the Nara period (710-784 A.D.), while the earliest use of paper stencils is recorded in the twelfth century. 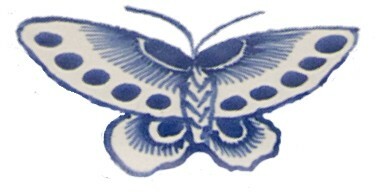 The art of paper stencil-cutting flowered in the Momoyama and Edo periods (1568 – 1868), when garments for men and women patterned using this technique became increasingly fashionable among all classes of society. 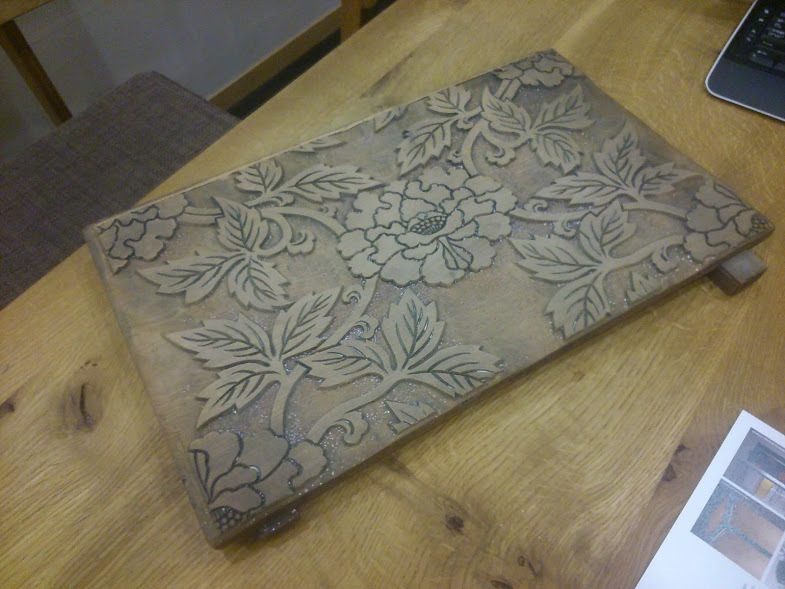 During my visit, which lasted two hours, Takeshi very generously explained in detail the techniques of his craft, showed me the tools used in the very intricate cutting of the stencils, and allowed me to try my hand at cutting a katagama. 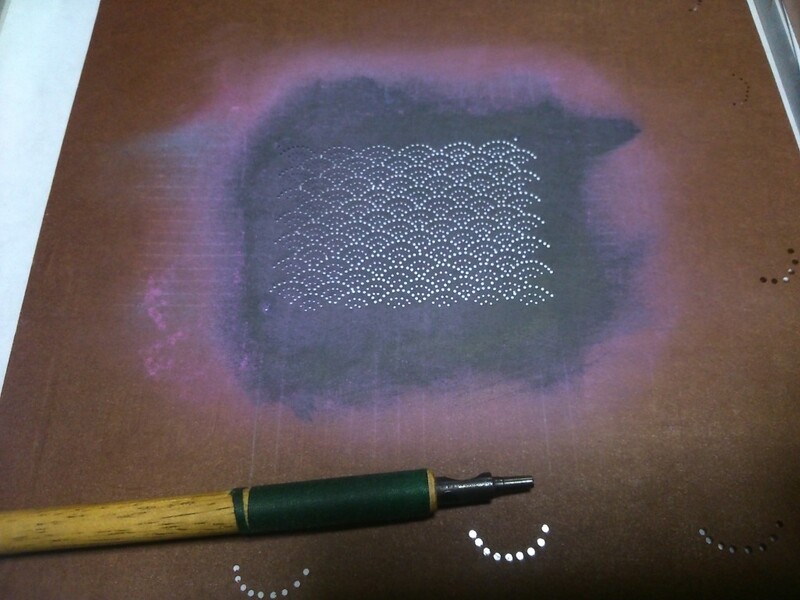 The stencil paper itself is brown and opaque, and consists of three layers of washi (Japanese paper) bonded together. The cutting tools fall into two categories – those for cutting dots and those for cutting lines. The dot cutters are tubular blades which produce holes varying from a fraction of a millimetre up to around 2-3 mm. The cutter is pressed gently into the paper and rotated – the waste paper is collected within the tube and can be ejected through a larger hole in the shaft. In skilled hands a line of dots can be made quite rapidly. Dots of varying diameter are combined to produce variety of line and effects of shading. Line cutters consist of single-bladed tools (resembling small scalpels) and twin-blade tools. The twin-blade tools are generally used for cutting lines of even thickness, but some are also designed to produced swelling lines (rather like an italic pen), useful for creating small leaf shapes. 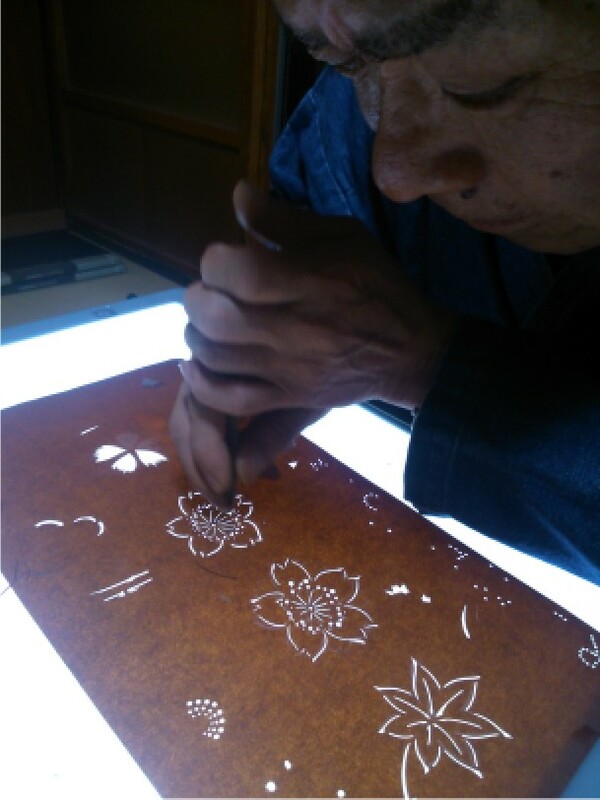 Takeshi demonstrated both types of tool by cutting a simple flower motif in a small sheet of stencil paper. Although katagama can be used to produce multi-coloured patterns, all of the stencils Takeshi makes are for single-colour designs. A great many are small motifs fitting onto stencils which are roughly A4 in size, but towards the end of my visit Takeshi produced some of his larger stencils – mostly abstract or geometric patterns, but also some figurative work – including a magnificient portrait of his cat, created almost entirely with dots. Takeshi’s skill lies purely in stencil-cutting – the stencils he produces are passed on to other workshops where silk is dyed and patterned. 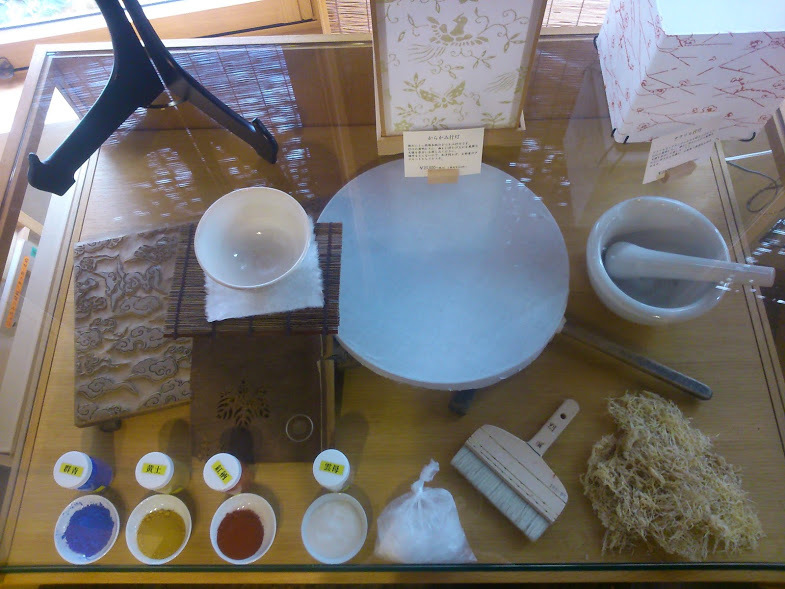 The processes involved in the various styles of dyeing known collectively as yuzen are too complex and various to even attempt to explore here – as I realised after seeing the exhibits and videos on display at the Kyoto Museum of Handicrafts. Suffice to say that the kimonos on display cover the full gamut of styles from austerely minimalist black and white to full-colour exercises in floral art. The catalogue of the 2014 exhibition ‘Katagama Style: Paper Stencils and Japonisme’ (Tokyo, Kyoto, Mei 2014) illustrates the influence of katagama on western designers at the end of nineteenth-century. 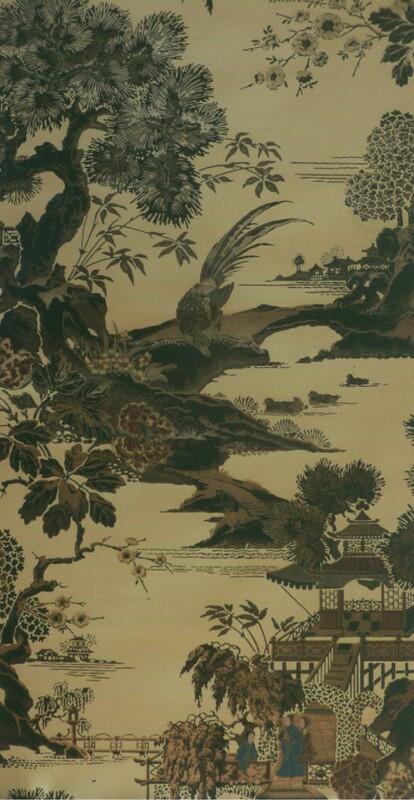 Wallpapers designed by Walter Crane, Lewis Foreman Day and Christopher Dresser are shown alongside the Japanese stencilled patterns which they drew on. Takeshi continues this tradition of east-west inspiration and collaboration in working with Paris designers to create products decorated in the katagama style – such as leather wallets, phone cases, i-pad covers and lamp shades hand-patterned with his designs. These images were taken on a recent visit to the Franconian Open-air Museum (Fränkisches Freilandmuseum) in Bad Windsheim, Germany. They show recreations of stencilled decoration used on the walls of rural buildings which have been moved from their original locations to the museum. Stencilling was widely used in the nineteenth and twentieth centuries in place of wallpaper in buildings of this type. 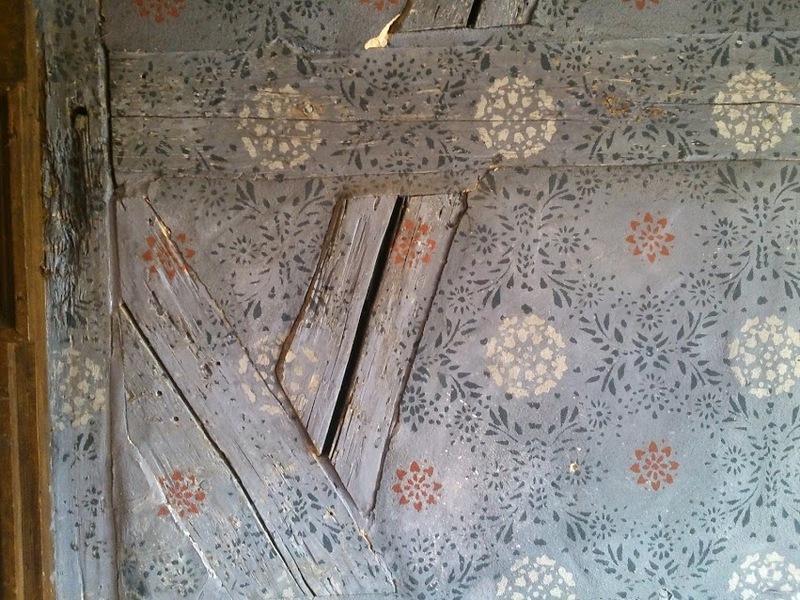 In many of the houses in Bad Windsheim several layers of painted distemper decoration can still be seen, showing that rooms were stencilled and re-stencilled regularly. Some of the patterns use two, three or more colours and must have called for some skill in applying them to the walls. Although it was something that an enterprising house-owner could do, it seems that the patterning was mostly carried out by specialists. Particularly appealing is the way the pattern flows across irregularities such as exposed timber framing. These buildings are nearly all substantial timber-frame constructions, with the walls plastered with a clay/sand mix. 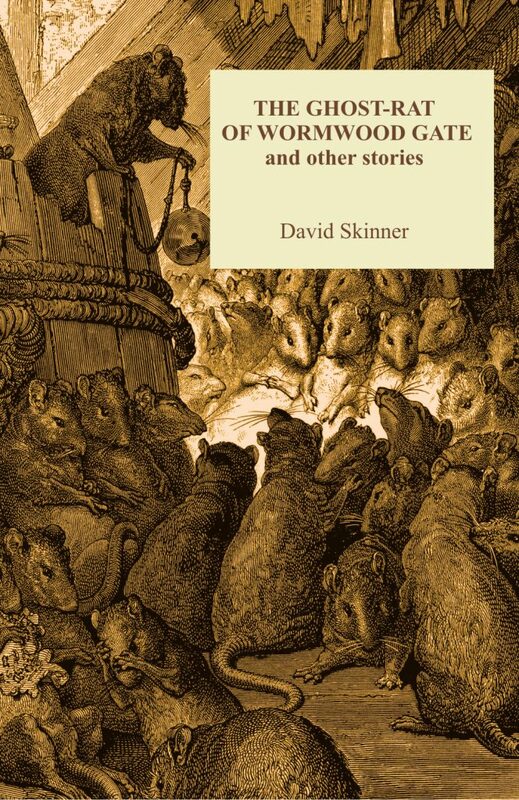 Apart from being inexpensive, stencilling in distemper was more appropriate than paper, which would have been difficult to fit into the beautifully irregular nooks and crannies of these wonderful homes. When the new owner of this 1830’s house in New Orleans’ Lower Garden District moved to Louisiana from Canada he left behind a room papered with our ‘Lissadell’ pattern – wallpaper is unfortunately an immovable asset in most cases. Happily for us, for the library of his new home he chose our ‘Kildare Star’ in gold on a duck egg blue, and was kind enough to send a photo of the result. The simple Regency (or Empire) rosette is perfect not just for the period and style of the house, but for contributing to the mood of elegant but relaxed formality that characterises the scheme – I particularly like the bespoke(?) 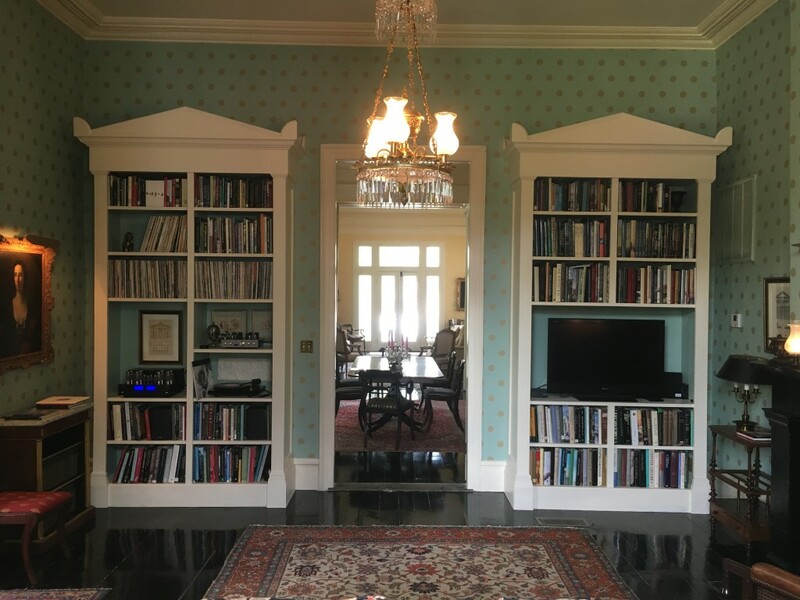 neo-Regency bookcases and the glossy black floor – and the fact that the library includes a collection of long-playing records on vinyl. 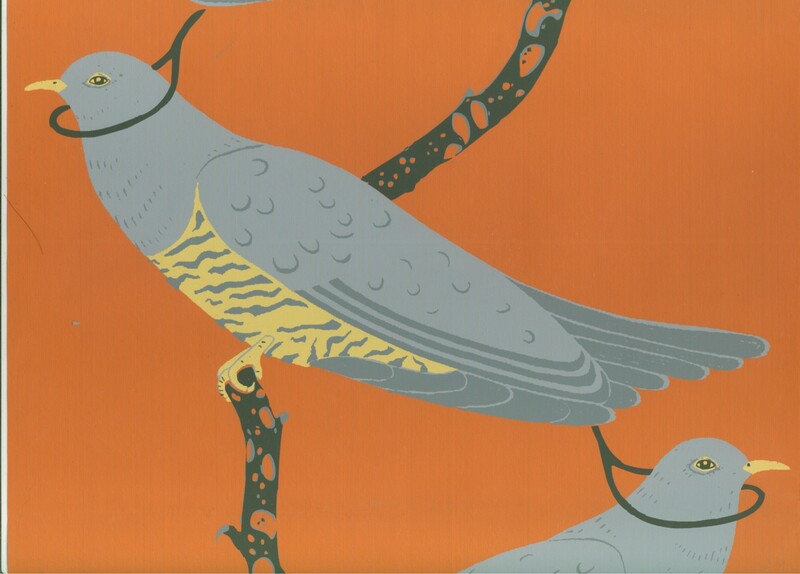 What better way to ring in 2017 than with a cuckoo from the wallpaper ‘Cloud Cuckoo Land’, designed by Irish artist William McKeown (1962-2011), and first exhibited in 2004? 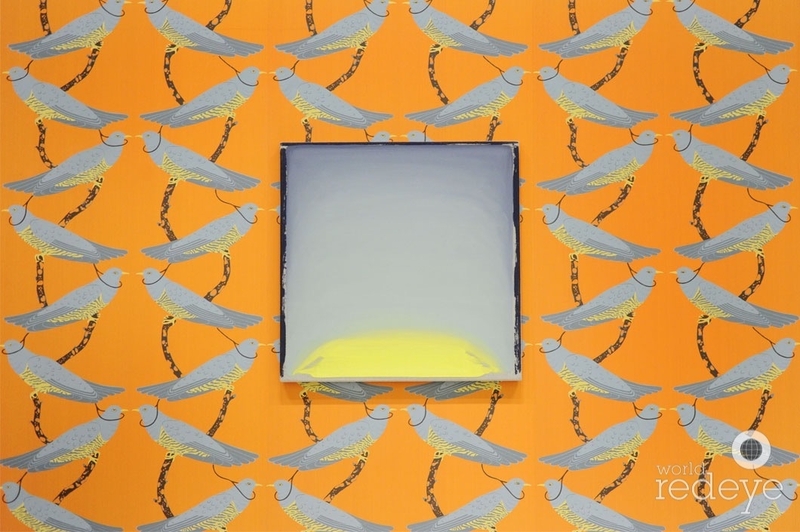 The scintillating orange background and perkily symmetrical birds strike an apparently positive note, but closer observation and reflection raise darker concerns. Colour symbolism, the habits of the cuckoo,the nooses around the birds’ necks, the way the birds form a mesh-like grid (not unlike chain link fencing), all hint at the artist’s experience of growing up in the divided and restrictive environment of Northern Ireland in the 1970’s. McKeown’s paintings – often exhibited against the wallpaper – are by contrast gentle, semi-abstract evocations of early morning light, inspired by his love of the Tyrone countryside where he was born. The few to which he gave titles (e.g. ‘Hope painting – the sky inside’) suggest that the paintings – all small and unframed – could be viewed almost literally as windows offering a view through and beyond the wall of birds. William McKeown, ‘Cloud Cuckoo Land’ wallpaper and untitled painting, in the exhibition ‘Chance Encounters II’ at Loewe Miami, until March 2017. For a material which is regularly described as ‘ephemeral’, it is remarkable how much wallpaper survives from earlier centuries. Here is a round-up of some patterns found in Dublin houses during the past two years, all dating from the late eighteenth or early nineteenth centuries. This was a boom time for wallpaper in Dublin – there were more manufacturers active in the city than during any other period, and observers commented that wallpaper was used by a broader spectrum of society here than in England. 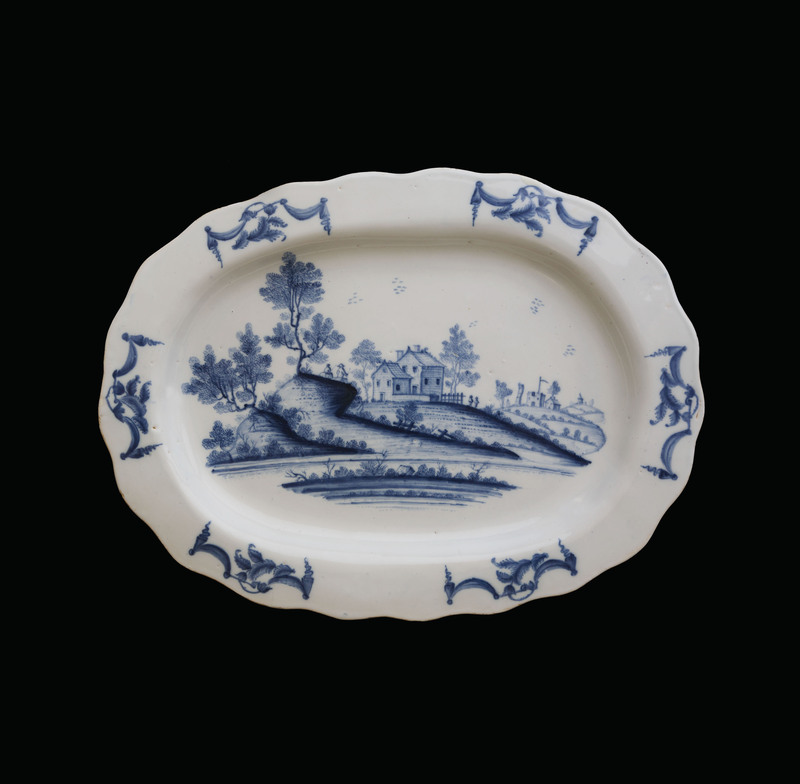 None of the patterns shown here were found in aristocratic town houses – instead, they give us a glimpse into how the homes of the middling majority were decorated. Some of these buildings are not as ordinary as they seem – the Thomas Street house contains a staircase whose timber has been dated to 1639, making it some 25 years older than 9/9a Aungier Street, previously thought to be ‘Dublin’s oldest house’. 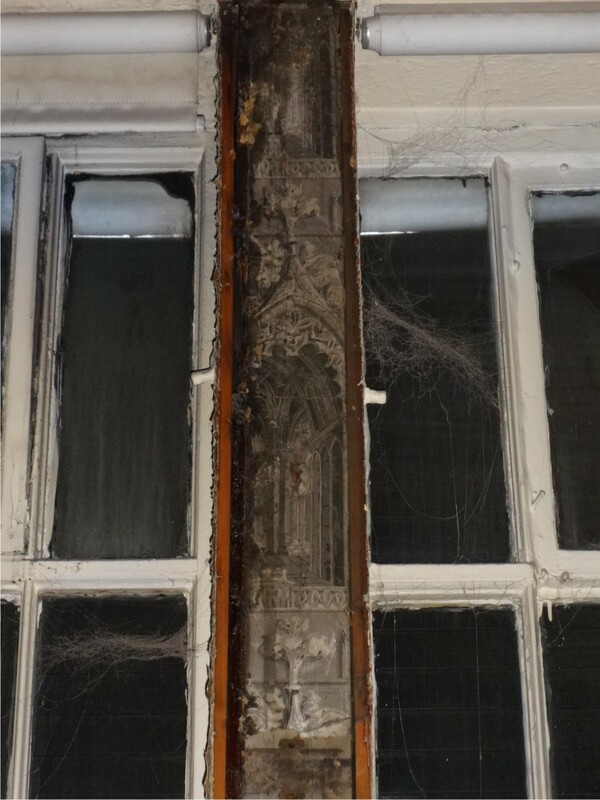 Alas, no traces of seventeenth-century decoration have been found in either building. From the front-facing first floor room of a house in Thomas Street overlooking St. Catherine’s Church, this paper may well have been on the walls at the time of the execution of Robert Emmett, which took place in front of the church in September 1803. 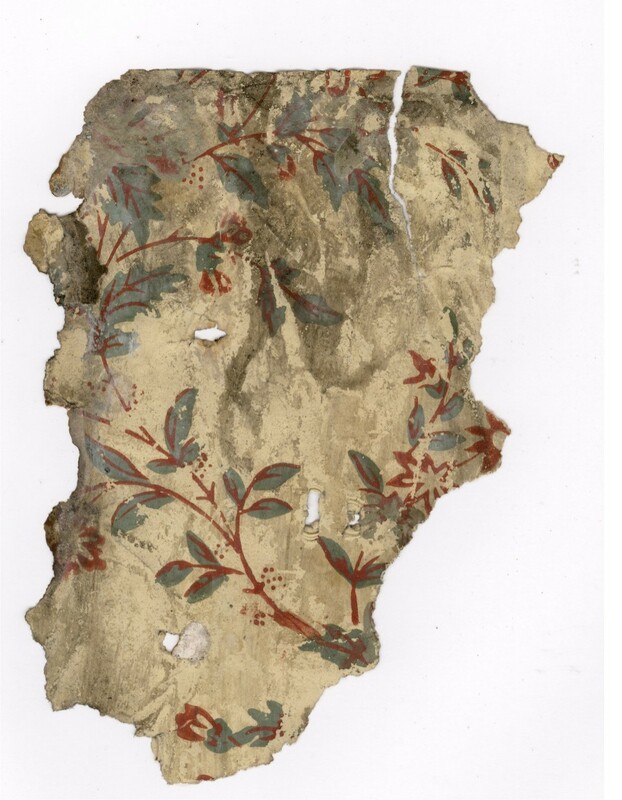 The main paper is hard to read, but seems to be printed with an all-over pattern of trailing stems in black, interspersed with small buds or flowers in red, white and blue. The matching border is better preserved, and was designed to resemble a gimp or passementerie textile edging. The colouring recalls French wallpapers of the 1780s and 90s. Wallpaper, block-printed in grey, maroon and ochre on a pink ground. 130 Thomas Street, Dublin. Ca. 1800-1820. This paper replaced the one described above, early in the nineteenth century. 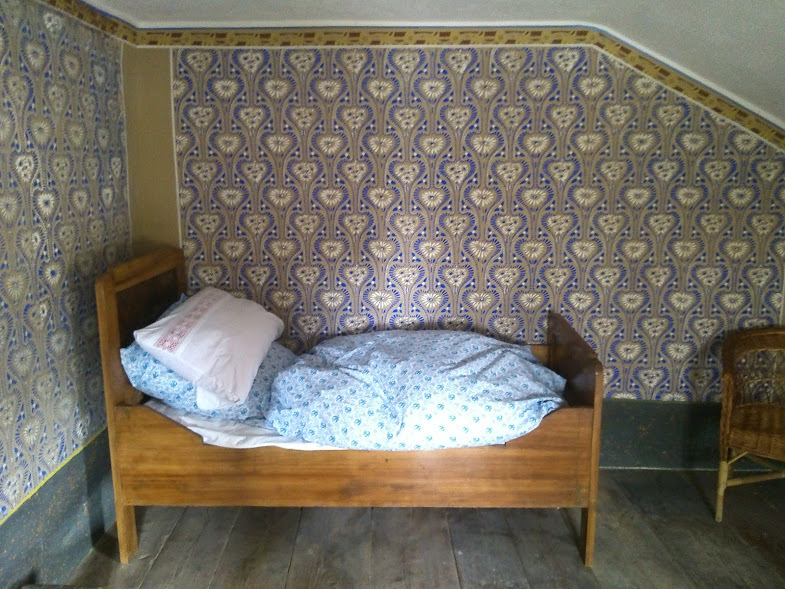 The pin-dot sub-pattern and the ‘shadowed’ leaf motifs were very common features of wallpapers from around 1800-1820, – many similar examples have been found in Irish buildings. This was perhaps a ‘safe’ (i.e. unassuming) choice of pattern for the years immediately following the Act of Union. 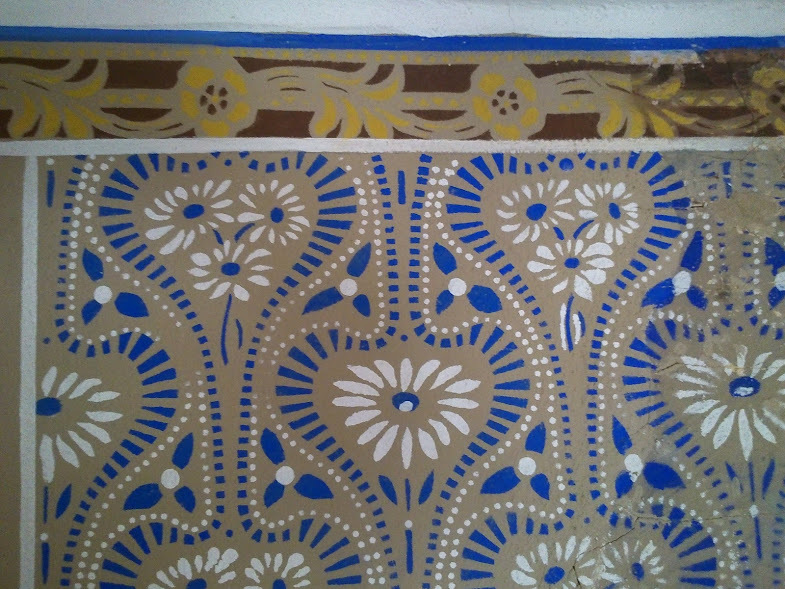 Wallpaper, block-printed in blue and red on a white ground. 9/9a Aungier Street, Dublin. Ca. 1790-1810. 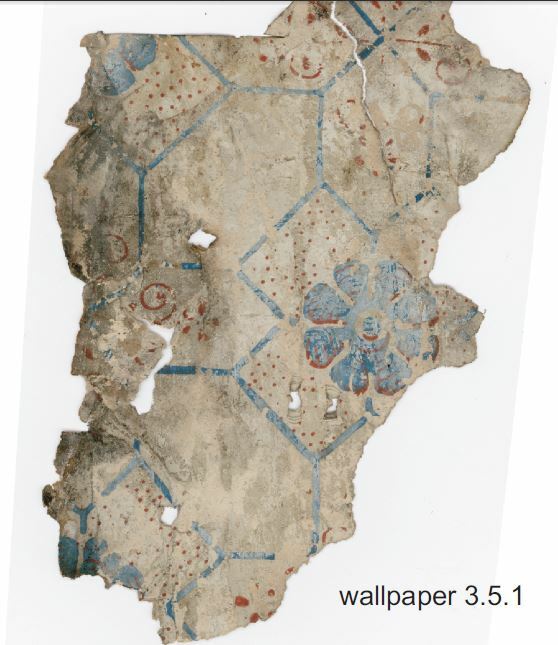 Similar in its colouring to the paper from Thomas Street (above), this pattern was found in the front-facing attic storey of 9/9a Aungier Street – another building with intact seventeenth-century structural features. This curious space – tucked under the rafters yet reasonably roomy – was carefully, even elaborately, decorated. 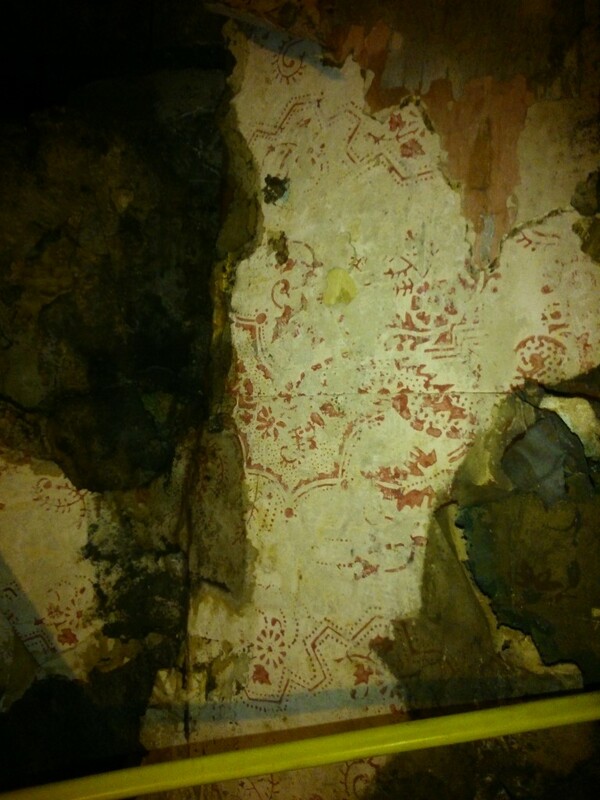 Apart from many layers of wallpaper, traces were found on the exposed rafters of polychrome stencilling, perhaps contemporary with this wallpaper, and executed in the same colour scheme. 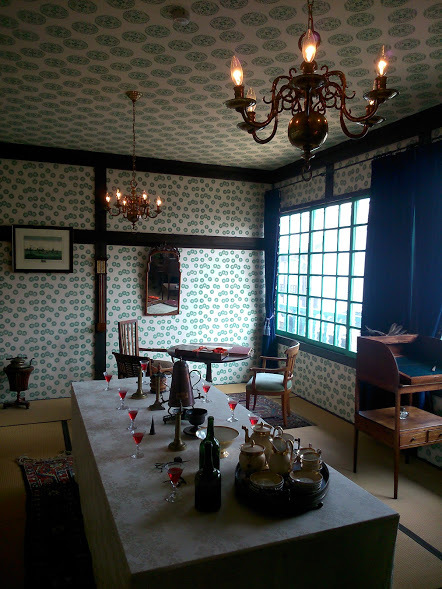 The room was re-papered frequently in the first half of the nineteenth century . The two subsequent patterns (see below) maintain the general colour scheme of red and blue on white, but with increasing economy – the red on white pattern would have been one of the cheapest available at the time. 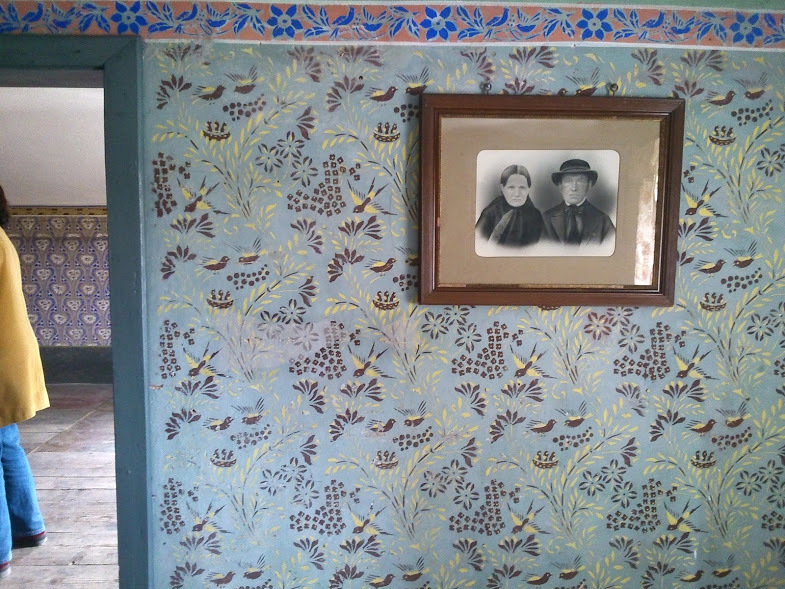 Wallpaper, block-printed in red and blue on a white ground. 9/9a Aungier Street, Dublin.Ca. 1800-1830. 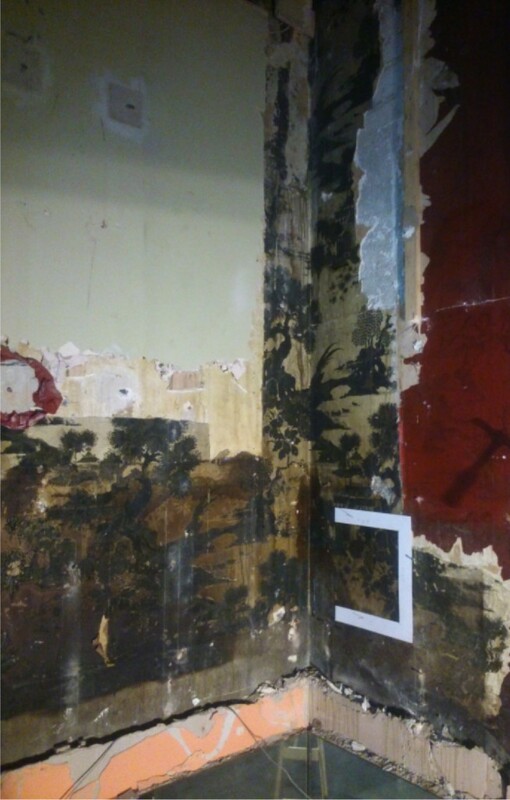 Wallpaper, block-printed in red on a white ground, 9/9a Aungier Street, Dublin.Ca. 1800-1840. By the mid eighteenth century Aungier Street was no longer a fashionable residential address, and many of its its once-fine residences housed barristers, later, tradesmen. Number 9/9a was owned by a coach-maker, who probably lived in the building. It’s hard to say with certainty who might have chosen this pattern – a barrister seeking to enliven his down-at-heel premises, or the daughter or wife of a well-to-do coachmaker. 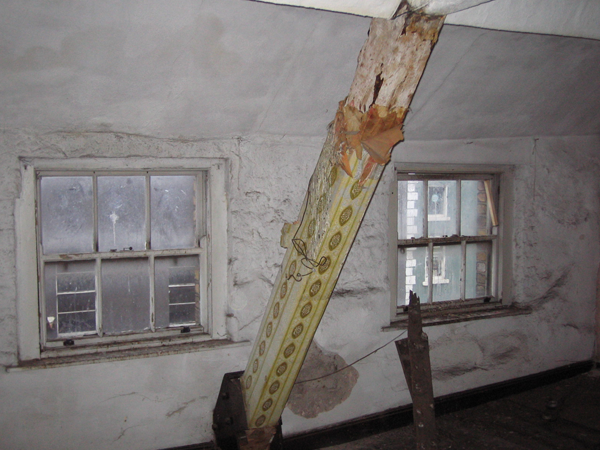 Attic storey room, 9/9a Aungier Street: fashionably papered around 1800. 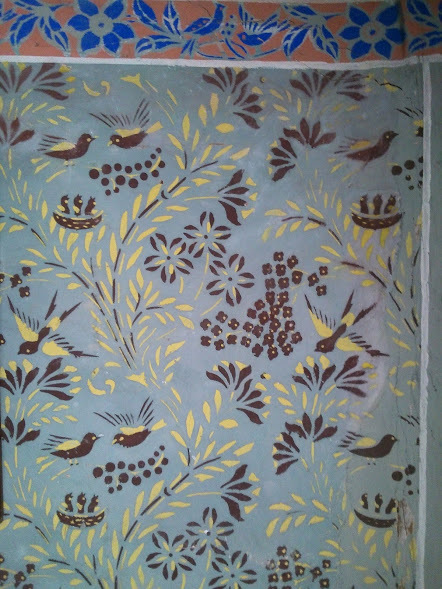 Wallpaper, block-printed in ochre and sienna on a pink-grey ground. James Street, Dublin.Ca. 1800-1830. 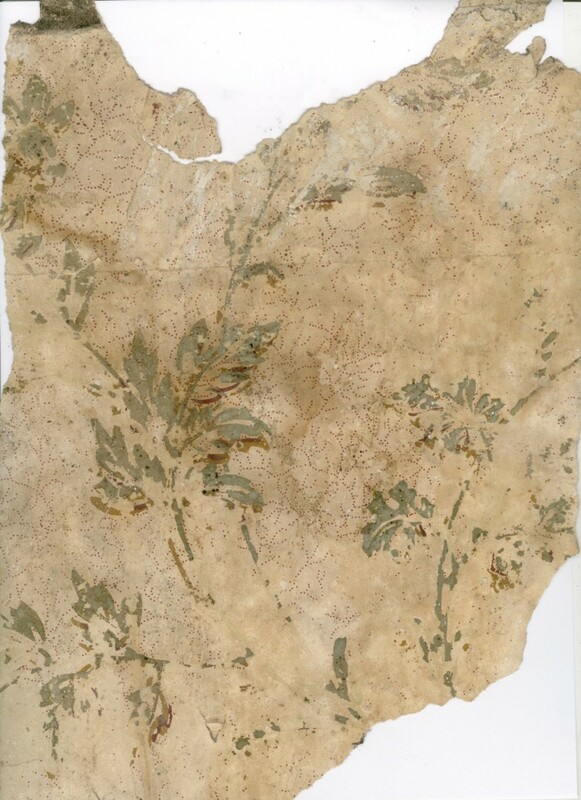 This elegant paper comes from a first-floor room in a house on James Street, close to the Guinness brewery, and reputedly once occupied by the head brewer. The pattern, with its fern-like scrolls and distinctive lobed leaf shapes, closely resembles our ‘Viceroy’ – a pattern used in the Viceregal Lodge (now Aras an Uachtarain) in the first decades of the nineteenth century. Wallpaper, block-printed in grey on a white ground, and border, block-printed in orange and white on a black ground. Ballymun Road, Dublin. Ca. 1780-1810. Ballymun Road is a street of mostly Victorian or Edwardian terraced houses in the suburb of Glasnevin. Among them is a two storey, three bay house dating from the early eighteenth century, at which time it was one of several rural villas in the area. Its low ceilings, thin timber partitions and lack of ornament must have given it an air of hopeless antiquity around 1800, when this border was used in conjunction with a grey and white all-over foliate pattern in two upstairs rooms. Amazingly, many of the buildings original simple internal features survive, along with many of the wallpapers used in the house in the course of its history. The grey paper with the small daisy motif, visible to the left in the image above, is earlier – perhaps around 1760. 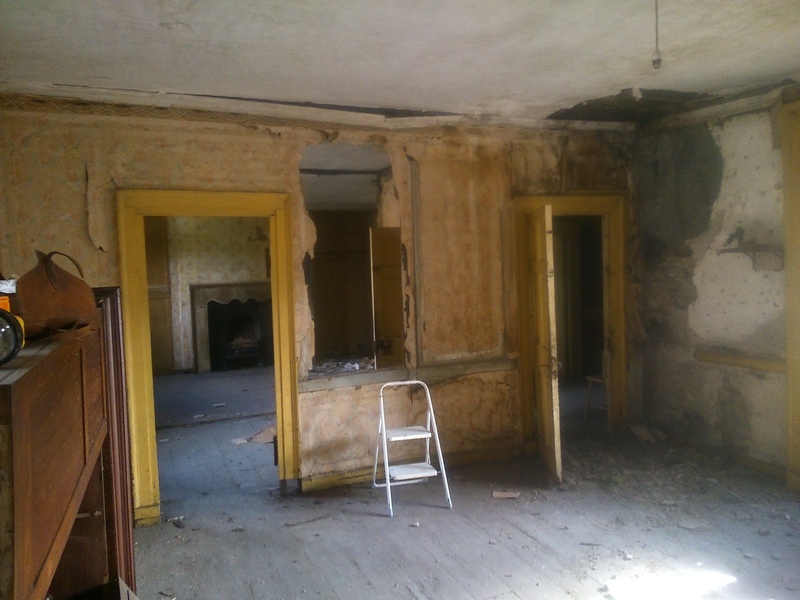 Ballymun Road, first floor rooms. The English architect and champion of the Gothic revival A.W.N. Pugin was so averse to certain types of wallpaper that he gave vent to his feelings in a typically polemic outburst, writing in 1841 of ‘…what are termed Gothic pattern papers..where a wretched caricature of a pointed building is repeated from the skirting to the cornice in glorious confusion – door over pinnacle and pinnacle over door…’ An example of just such a pattern came to light recently during the refurbishment of a house on Dublin’s Ormond Quay. Block-printed in shades of umber-grey, the pattern consists of elaborate pointed arches opening onto views of a cathedral interior. The only surviving piece of the paper was found attached – rather incongruously – to the mullion separating two windows which look out onto the quay from the ground floor front room. At first glance, the design is reminiscent of the ‘pillar and arch’ paper found recently in Trinity College (see ‘Paper Pillars of the Establishment’), but it dates from almost a century later. The repeating gothic arches and the illusionistic representation of space behind them (resulting in an illogical multiplicity of vanishing points) are exactly the kind of elements which caused Pugin’s spleen to rise. Not content with condemning such patterns on aesthetic grounds, Pugin went on to complain that they were ‘a great favourite with hotel and tavern keepers’. He seems to have been correct here, as the occupants of the Ormond Quay house in the early nineteenth century were consistently employed in the vending of alcohol: from 1822-31 it was a Spirit-Stores; from 1832-42 the owner was listed as a Tavern Keeper, and in 1847 it was the premises of a Wine Merchant. It may strike us as odd that depictions of ecclesiastical architecture were considered a suitable backdrop for quaffing strong liquors, but in today’s Dublin, where disused churches find new life as bars, nightclubs and even distilleries, the symbiosis of the spiritual and the spirituous seems just as unproblematic. Not far from Ormonde Quay, the former St. Mary’s Church at the corner of Mary and Jervis Streets has been converted to a pub-nightclub-restaurant, where revellers can pause to read the memorial slabs of eighteenth-century parishioners, while across the river the former church of St. James in the Liberties is soon to re-open as the Pearse-Lyons Distillery, the tower of the 1861 structure now enhanced with a dramatic steel and glass steeple.